This character is dear to my heart, because she is a painter like myself and is curious about the world around her. I was raised in an area in rural Montana much like that of the settings for my art mystery novels, as well. I paint, go to art shows, teach workshops, and enjoy the world of art. My husband and I also live in an area where cats show up indiscriminately and of course, we take them in and feed them. It's one of the detriments to being kind-hearted and living just a few miles out of town. It seemed natural that my heroine would own a cat, and Jack is based on a real cat who once belonged to my dad. (I inherited the real Jack) I am always happy to hear of readers who enjoy my stories as much as I love writing them. When Jessie O’Bourne is asked to stand in at the last minute for an indisposed friend, as guest artist at the annual Crooked Creek Art Expo in Montana, she is thrilled to do so. Travelling in her beloved RV she’d nicknamed Hawk, along with her ‘ornery, ginger tom cat, the King Jack Dempsey, she is excited about the opportunity to present her work, run some workshops, and possibly sell some of her paintings at the expo. Although she lives and paints in Santa Fe these days, Jessie is a born and bred Montanan, coming from Sage Bluff just up the road from Crooked Creek. She knows she will run into many old friends at the expo, both from Montana as well as among the group of fellow artists who tour the art expos of the Midwest as part of their business. What she doesn’t expect is that she will be caught up in a murder mystery that just gets deeper and odder the further she delves into it. This is the scenario Mary Ann Cherry presents readers with in her murder mystery, Death at Crooked Creek. Currently sworn off men after a messy encounter with FBI Agent Grant Kennedy and a difficult breakup with her childhood sweetheart, Russell Bonham, now sheriff of Sage Bluff, Jessie certainly does not expect the romance that comes her way in this story either. 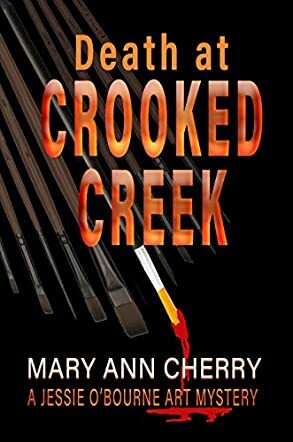 I’ve read a few murder mysteries in my time, but few of them have been as cleverly crafted with as many red herrings thrown in as Death at Crooked Creek by Mary Ann Cherry. This is superbly written with a plot that takes you on twists and turns you don’t expect and leaves you guessing or, even better, makes you think you know “whodunit” before the actual reveal. I loved the artistic setting of the story and the fact that the author, an artist of note herself, was able to inject her knowledge into the story naturally and without artifice. As someone who struggles to draw a stick figure, I could really appreciate the skill and artistry of the characters described in the story. The book is so easy to read that I just kept going, effectively finishing the story in one long sitting. I’ve never read any of this author’s work before, but this book has definitely awakened my interest in her writing and I will be checking out what else she has published. I cannot pay this author any higher compliment than to say, I want to read more about Jessie O’Bourne’s crime-solving adventures. I note there are currently two Jessie O’Bourne books in the marketplace and I can only hope there are more on the way. A highly recommended read. Step into the life of an artist, Jessie O'Bourne, a zealous red-head who could be considered an amateur sleuth with an eye for detail. Death at Crooked Creek is woven with an art expo, friends reuniting, and murders. Author Mary Ann Cherry draws on her own love of art, cats, and Montana to create a thriller that keeps the reader guessing until the last chapter. Several people have had motive, means, and opportunity for a few of the deaths, but only one has a connection to all five. Jessie stays busy with her guest artist requirements, but her friends are concerned about the threats she is receiving after a young man is killed and stuffed into her mobile home. Not only could she be next on the list, but maybe die by the hand of a friend. Here comes a woman who uses her skills as an artist to spot the details left by a killer. Mary Ann Cherry adds a lot of suspense and cleverly plants evidence in plain sight. Death at Crooked Creek is a well written mystery with a touch of romance. I loved how she made the people come to life through their distinct personalities, making them seem like the person next door. Friendships are sacred and the author builds this around an art expo, which is something she herself enjoys attending as an artist. She enlightens the reader as to the world of artists and the ups and downs they experience in their line of work or hobby. I enjoyed this book and looked forward to reading more every time I had to set it down. The vivacious and determined artist Jessie O’Bourne has returned in the second book of the Jessie O'Bourne Art Mystery Book series. She was invited to an art show at the Crooked Creek Lodge in Montana. When a body was found in her beloved motor home that she lovingly referred to as the Hawk, her involvement in the mystery was sealed. Her friends, Detective Sergeant Arvid Abrahmsen and his wife Esther, from Sage Bluff, Montana, soon joined the quest for the killer. Arvid sought permission to work with Sheriff Fischer, and he watched over Jessie who received threatening notes, accompanied by toy tractors. This was not the first murder in Crooked Creek, and it seemed that all of them might have a common thread, but what could it be? In Death at Crooked Creek by Mary Ann Cherry, the mystery becomes more and more convoluted. Although finding the killer, or killers, is the main focus of the story, there are many additional features. Jessie’s skills as a painter are aptly described, and these are interesting for those who are not familiar with artistic techniques. The overwhelming tasks of hosting an art show, the joys and concerns of the artist vendors, and even the FBI involvement in possible illegal activities in the art world are eye-opening. And, there is just enough romantic interest in Jessie, from several different men, to add a lightheartedness to the growing number of murders. Author Mary Ann Cherry has written an intriguing art mystery story in Death at Crooked Creek. I enjoyed how convoluted and complicated the story was - better than many other mystery books! A fascinating read! In Death at Crooked Creek by Mary Ann Cherry, artist Jessie O’Bourne goes to the annual Crooked Creek Art Expo in Montana as a replacement for a guest artist who couldn’t make it. Together with her tom cat, Jack, she resides comfortably at a lodge that hosts the art show, leaving her motor home, the Hawk, unattended for some time. When she discovers a dead body hidden in the Hawk’s storage area, she finds herself entangled in a murder investigation, and soon receives threats. The killer, hidden among the artists, guests, and people who run the art show, must be found before Jessie becomes the next victim. Crooked Creek, Montana in March is a great setting for this solid whodunit story. Cherry described the place well enough for me to imagine the snowy environment which also revolves around the artists and their art. The plot is substantially complex, well structured and has a moderate pace overall. The narration is clear cut and an easy read. I’m glad that the romance between the well fleshed out characters is somewhat toned down and doesn’t overwhelm other aspects of the story. At times I felt there was a bit too much going on, and I was slightly ambivalent about the chronological style. However, after a few chapters, they were not an issue, and Cherry did well to connect the events from the past and the present. I had fun trying to piece all the clues together and guess the perpetrator from quite early on. Without giving away any spoilers, Jessie’s encounter with some of the characters about a mysterious text message was when the real detective fun started for me. All in all, an enjoyable read.